Well it’s been interesting out here in Hollywood. With the potential pending SAG strike looming, a lot of work is shut down until the dust clears. So, I’ve been keeping busy with ad work and other odd assignments. I may be going back to the east coast and work there until things get back to normal but nothing is for sure. Just weighing my options. One a lighter note, I am posting a new piece of art. It’s rare these days that I get to do anything for myself or for the fun of it. Today I saw the commercial for the new Indiana Jones movie and got motivated. 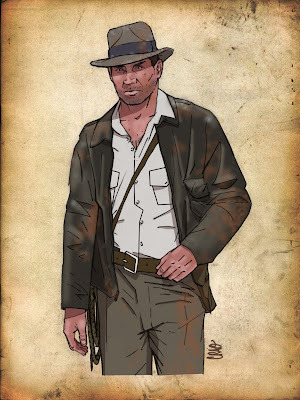 So here’s a sketch of “Indy” just for fun. Hope you enjoy it! I hope to do more ‘for fun’ and I’ll post it as I do it.